Powers/Abilities: Heater has the ability to make men go ga-ga over her. She's an attractive woman, apparently highly skilled in the arts carnal. She may have the ability to alter her physical form, either naturally or via technological means. When initially seen she had blue skin, brown hair, and a tail. When next seen, she had the appearance of a blond-haired, blue-eyed Caucasian female, who liked to wear a lot of blue eye shadow. In her most recent appearance, she was still blond, put had dark pink skin. She formerly used a Pleasure Cruiser. History: Heater's origins are unknown. (Warlock I#12 (fb) - BTS) - Heater was a lover of Eros/Starfox in the past. At some point she was sold into slavery, and purchased by Pro-Boscis the Procurer, who used a bracelet to trap her within a Pleasure Cruiser, and force her to serve as one of his prostitutes. Heater managed to contact Eros, but--knowing that whoever freed her would have to fight Pro-Boscis--she asked him to stand back so she could recruit someone else--whom she wouldn't care if his face was injured. (Warlock I#12) - Heater encountered Pip the Troll on Sirus X, she enlisted his aid to free her from Pro-Boscis, promising him unbelievable pleasure if he succeeded. Pip managed to cut the cable holding Heater, but Pro-Boscis appeared seconds later. Through luck and ingenuity, Pip managed to defeat Pro-Boscis, at which point Eros walked up, and Heater began to kiss him. To her rescuer, Pip, she gave her former Pleasure Cruiser. (Avengers Spotlight#21/2 (fb) - BTS) - Heater set up a nice little business for herself. Eventually, she fell in love with Black/Dark Roger, the Monarch of the Mystery Planet. However, Roger wanted to establish a "hundred year contract" with Heater, and she wasn't ready to settle down. When Roger refused to take "No" for an answer, Heater couldn't think of any other way out, so she sold herself into slavery to Aaron the Aakon (she did later realize that this made her a "ditz-brained space cadet). Eventually, she became the property of Axel the Rescorlan. (Avengers Spotlight#21/2) - Eros came to Heater's rescue, pretending not to know her, but picking her out for purchase as a companion. However, as he was concerned whether he would have enough credit to pay for her, he drove the Rescorlan into a frenzy via haggling. However, as she left with Eros, Axel regained his senses and sent the rest of the Rescorlans after them. Eros leapt into the air, taking Heater to his father's fastest ship, and the two took off. (Marvel Comics Presents#22/4) - As Eros and Heater relaxed together, their ship crashed into the Principle of Reasonable Return, the ship of Aalbort the Aakon, which had been assaulted by Azunbulxibar and his warriors. Heater stayed in the background as Eros managed to outwit and banish the warriors, and then she hugged him, proclaiming him, "My hero!" 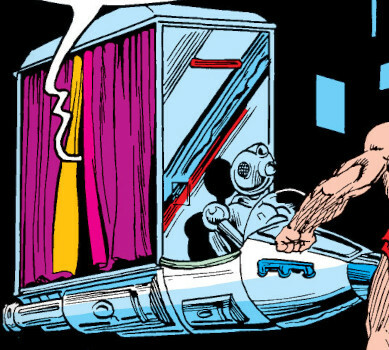 (Marvel Comics Presents#65/4) - Heater accompanied Eros to a the planet Kotzwinkle, one of the more bustling, yet dignified, center of commerce in the galaxy. She was very impressed when he bought for her a bracelet of cubic zirconium, which was so rare that it could only be found on Earth. They later went to the Check Lounge III to meet up with one of Eros' old friends, the musician Howlin' Wolf. However, as they talked, they were interrupted by Dark Roger, who again proposed to Heater. When she refused, he transported the entire club to the Caverns of Silence of his Mystery Planet. Howlin' Wolf then transformed into wolf form and drove off Dark Roger and his men, while Eros reversed Dark Roger's device, returning them to Kotzwinkle. Comments: Created by Jim Starlin and Steve Leialoha. It's neither confirmed nor denied that Heater actually had to serve other clients before recruiter Pip. Heater was based on Jim Starlin's old girlfriend Heather Devitt (confirmed in an interview in COMIC BOOK ARTIST #18). It could provide a variety of...comforts, as well as to transport her through air or possibly even space, providing a comfortable atmosphere in spite of outside winds, etc. The Cruiser appeared to be a tesseract, having much more space on the inside than would appear from the outside.